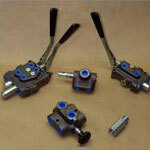 Hydraulic Valves Accessories – Metro Hydraulic Jack Co.
We sell a large variety of valves and accessories that are an integral part of any hydraulic system or hydraulic jack equipment. They are used to connect different components, filter fluids, indicate operational pressure, view oil level and temperature, transport fluids, and control how the system will function. Our sales associates are experts at specifying which components are needed. Metro Machines designs and manufactures hydraulic valves for the agricultural, construction, turf and light industrial equipment markets. 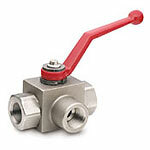 Valve types include 1, 2 & 3 spool directional control valves; two position selector valves, lock valves, check valves, restrictor and relief valves – all in various sizes. A manufacturer of quick coupling products providing a variety of sizes and port configurations ranging from 1/8 inch to 2-1/2 inch sizes to accommodate a wide field of application requirements. 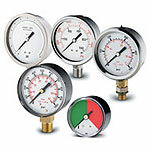 Working pressures extend to 10,000 psi, materials range from Brass to 316 Stainless Steel, and an assortment of seal options are available. Complete line manufacturer of quick disconnect couplings and valves for industry, construction, subsea, military & aerospace. Full line fitting manufacture featuring pipe , JIC flare, SAE o ‘ring, flat face o ‘ring, compression type, live swivel fittings and flanges in steel, brass or stainless steel. 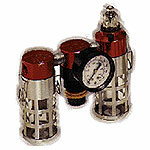 Complete line of pressure gauges and gauge products. 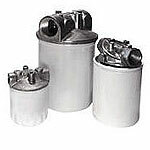 A supplier of fluid power accessory components including, Low Speed High Torque Hydraulic motors, Hydraulic gear pumps, Pressure gages, Ball valves, Inline check valves, Flow control and Needle valves, Diagnostic test points & plugs, Test hose, Breathers, Filler breathers, Sight level gages and Aluminum Manifolds. 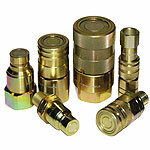 A supplier of quick disconnect couplers, valves, gages & clamping components. 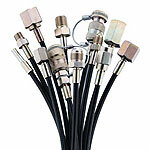 Leading manufacturer of hose and fittings. Manufacturer and supplier of hydraulic reservoirs, hydraulic accessories, flexible couplings, oil coolers, oil filters, sight and pressure gages, tank magnets. Flow Ezy Filters – Filters, Strainers & Accessories.